Did you think I forgot about the blog hop? Or maybe I had joined Buckeyes Anonymous considering all the upheaval over at The Shoe? Well, I haven’t. Just got busy doing other blog stuff and haven’t gotten around to posting the link up for the last couple of months. Any of the local Buckeye Bloggers doing something fun and new this summer? We went on a great hike to Old Man’s Cave (my first time ever), we enjoyed a day at the new Columbus Commons, caught the fireworks at Buckeye Lake (another first) and we have a few other activities planned before school starts on *gasp* August 15th. I would love to hear what fun things your families are doing….maybe it’s something that this Florida girl has never heard about. Post it below after linking up. The linky is up and running till the end of the month, so go ahead and check back when you want to see if anyone new has joined. Feel free to write your own post and include the linky on your site – The more the merrier! If you have any ideas on how to make this hop more successful, please drop me a line! I would love to hear from you! Thanks again for linking up and I can’t wait to “meet” all my fellow Ohioans! 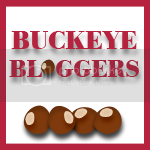 Snagging your Buckeye Bloggers button. Thanks, Melanie! How about a weekly, even a monthly hop for Buckeyes to link up a monthly blog post of their own? You can utilize inlinkz for us to link up, making it easier for us to find one another.